Back-to-school is that time of year when we need weeknight dinners to be as quick and easy as possible! And how about making them taste good and be good for us, too? Well, I’ve got the perfect recipe for you that, along with some whole-grain wild rice, can be thrown together with very little effort to make a well-rounded, tasty meal. Plus, with the pesto being made with half spinach, you can really feel good about offering this one to your family. Enjoy! 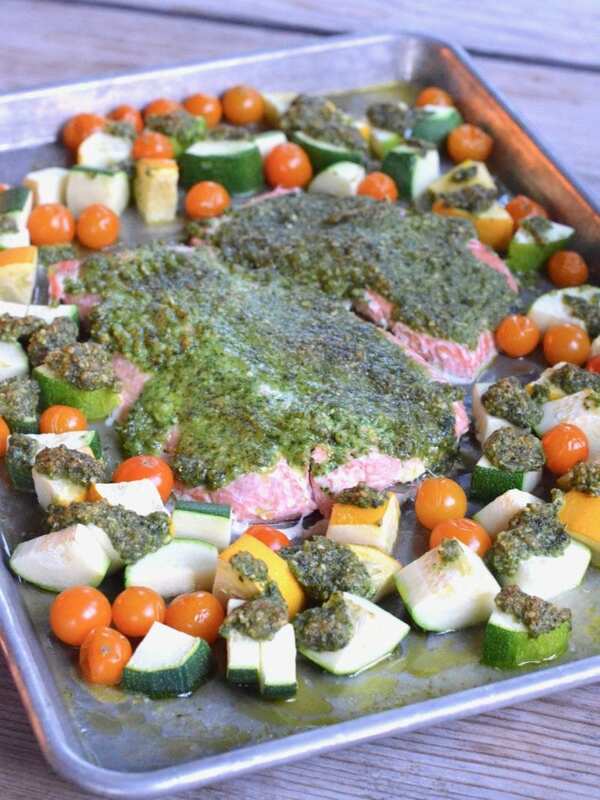 On a sheet pan, arrange the salmon in the middle with the cut veggies and cherry tomatoes in a circle around it. Set aside. In a food processor combine the spinach, basil, Parmesan, pine nuts, olive oil and garlic. Blend until smooth. 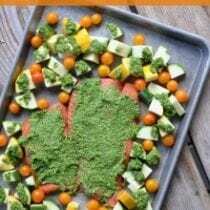 Spread the pesto on top of the salmon and spoon the remainder on top of the veggies. Bake until the salmon is done (no longer dark pink in the middle) and the zucchini/squash can easily be pierced with a fork, about 18 to 20 minutes. Serve warm and enjoy. We had ours with wild rice on the side. This looks delicious. I need a new way to make salmon, or other fish. I think my family would want the vegetables more roasted, so I might try it with the veggies in the oven a while before adding the fish. If you take your piece of salmon, skin side down, and spread a thin layer of veganaise on top, and then sprinkle furikake seasoning on it and then bake. It is so delicious! 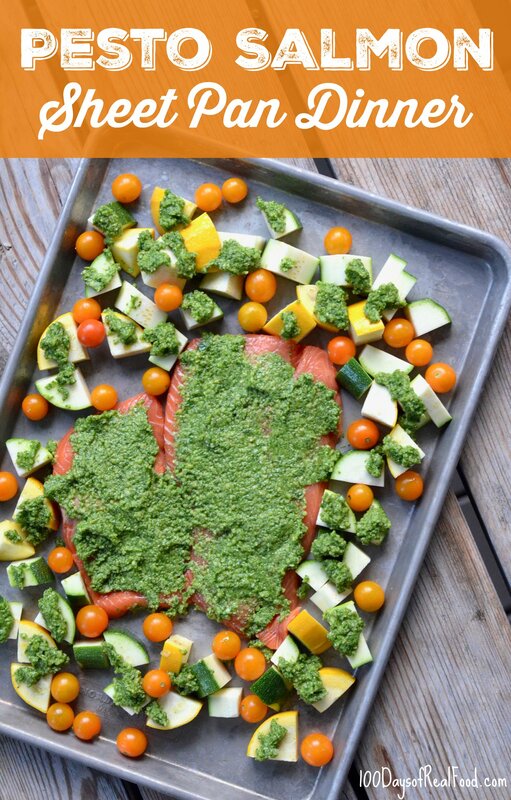 great pairing (salmon and pesto)! love it, especially all in one pan, that much easier, thank you! Looks very yummy. Love to taste it! Perfect! I have salmon and a basil plant ready to go at home- just need to pick up some veggies to make this dish. Can’t wait to try it. Sounds great! Budget saving tip- you can sub the pine nuts for sunflower seeds (which are cheap to buy in bulk.) It won’t taste exactly the same but very similar and delicious. This was so good and really easy. The salmon was moist and the flavors were great. One out of 2 kids enjoyed it so that works for us.